Henry Kissinger flew into Toronto this week for a conference, and at 91 years of age, demonstrated the mental acuity that earned a front-row seat in foreign policy circles for decades. He spoke at the International Economic Forum of the Americas about his latest book, World Order, which astutely links the past and present to future events. The premise is that world order changed after 9/11 and the new normal is a multi-polar mix of nation-states, regions, cultures and shadowy non-state players. Before that, a binary Cold War pitted two ideologies against one another in a grip of mutually assured destruction. But now too many irreconcilable differences, and no diplomatic mechanism to find common ground, exist. The only effective international institutions are economic, not political, which further puts these factions at odds with one another. The absence of international cohesion results in unilateral actions, often uninformed by either history or geographic reality. The most egregious examples of late are the invasion and nation-building attempts in Afghanistan and Iraq. Kissinger supported the Iraq move, but has since recanted. "I thought it would be a quick operation to replace Saddam [Hussein]," he was quoted as saying. Instead, as we all know, it turned into a long-term occupation to create a first-world democracy from scratch in a geography that wasn't a cohesive nation-state. 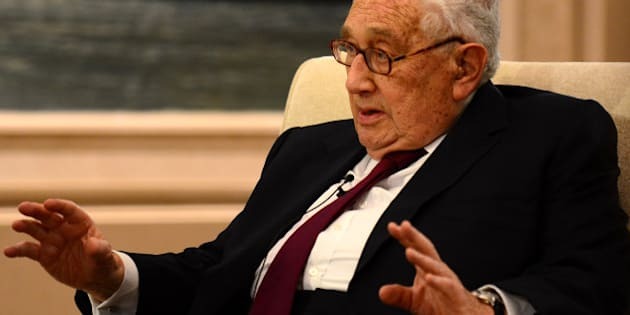 Kissinger points out that since the Second World War, four of the five wars the United States has been involved in have resulted in withdrawals -- Korea, Vietnam, Iraq and Afghanistan. Kissinger worked with Nixon who inherited the war from Johnson and the only "success" was the Gulf war which, ironically, liberated an undemocratic monarchy in Kuwait. Kissinger's best contribution to this global challenge is his analysis that technology is another player that must contribute to world order, not disrupt it as is now the case. He believes that cyber warfare and real-time information flow impedes decision-making, democracies and diplomacy. "Conflicts within and between societies have occurred since the dawn of civilization, but the immediacy of information is a test. Every incident is flashed round the world, everything becomes part of domestic politics, political careers are molded in public. Boldness, leadership and stealth are all more difficult," he wrote. Kissinger describes four models of "world order" extant: Europe's Westphalian model of nation-states with equal status; the U.S. model; China's notion of itself as a great regional power; and an Islamic system of believers and infidels. These parallel universes can find common ground only if a "globalistic second culture and concept of order" is created. The United States cannot lead, but is an indispensable agent for peace and diplomacy. To avoid pitfalls, he suggests that his adopted country must first ask is unilateral intervention appropriate? Is multilateral? Or should the U.S. stand down? He believes the current coalition of nations to destroy ISIS is appropriate given its threat to the region and beyond. Kissinger, however, would not restrict intervention to bombing attacks, but would "have special force units move rapidly and turn the game around." But destroying ISIS won't change the fact the region is enmeshed in the equivalent of the Thirty Years War between ethnic, ideological and religious groups. Europeans artificially drew their borders in 1920 and the notion of an Iraq nation (or Syria) is a "pipedream." Similarly, the West must be careful in the Eurasian region involving the Ukraine and Russia situation. "We say Ukraine is a state. For Russia, Ukraine is part of Russian patrimony -- Russian history. Each side is acting rationally, but they are escalating their commitments into a disproportional crisis." Putin has "overplayed his hand," but the West cannot do the same or it will push Russia into China's arms and create power vacuums in Europe and Asia. Kissinger's book is important, but its biggest contribution is that it's non-partisan and non-ideological but synthesizes history and current events from an altitude of 32,000 feet. In addition, he has been among the first to identify technology as an important factor if order is ever to be restored, not just geopolitically, but psychologically. "In the Internet age, world order has often been equated with the proposition that if people have the ability to freely know and exchange the world's information, the natural human drive toward freedom will take root and fulfill itself, and history will run on autopilot, as it were," he wrote. "Two different people appealing to a search engine with the same question do not necessarily receive the same answers. The concept of truth is being relativized and individualized, losing its universal character. A surfeit of [subjective] information may paradoxically inhibit the acquisition of knowledge and push wisdom even further away than it was before." Likewise, he points out that while technology assisted the Arab Spring phenomenon, it has also been harnessed to identify and repress those who wanted change. "And [in the U.S.] Presidential campaigns are on the verge of turning into media contests between master operators of the Internet," he said. "Wisdom and foresight are needed to avoid hazards and ensure that technology fulfills its vast promise."